According to a new market report published by Transparency Market Research titled “Industrial Fasteners Market (Commodity – Bolts, Nuts, Screws, Washers, Rivets, Others; Application – Automotive OEM, Machinery OEM, Fabricated Metal Products, Construction, Others) – Global Industry Analysis, Size, Share, Growth, Trends, and Forecast, 2018 - 2026,” the global industrial fasteners market is expected to reach a value of US$ 104.94 Bn by 2026. In terms of value, the market is estimated to expand at a CAGR of 2.2% during the forecast period from 2018 to 2026. In terms of volume, the market stood at around 26.7 million metric ton in 2017. The Asia Pacific industrial fasteners market is projected to have the highest growth during the forecast period in terms of value (US$ Mn). The market witnessed considerable growth in this region due to increased growth in construction, automotive, and manufacturing industries, leading to positive growth in the industrial fasteners market. The industrial fasteners market is influenced by market dynamics with the prime driving factor of increasing fasteners demand from the construction industry. In terms of commodity, the screws segment is anticipated to gain the largest share with total value of US$ 21.30 Bn by 2026 at a CAGR of 1.6% annually. In terms of application, the global figures for automotive OEM segment are anticipated to be valued at US$ 30.67 Bn by 2026 at a CAGR of 2.6%. However, fluctuating prices of raw materials such as steel, copper, and aluminum have impacted the margins of manufacturers and is one of the major challenges restraining the growth of the industrial fasteners market. The bolt and nut segment is expected to expand at a CAGR of 2.6% and 2.9% respectively in terms of value over the forecast period due to their increasing applications in the automotive and construction industry. Furthermore, growing manufacturing of medium commercial vehicles, light commercial vehicles, heavy earth moving equipment, textile machinery, machine tools, aircrafts, and utility vehicles have led to the enhanced growth of the fasteners as their sub or main assembly part. The market for industrial fasteners is fragmented in nature and is characterized by large competition with small and large players in the industry competing to maintain their respective positions. High tensile fasteners are majorly utilized in engineering applications which include industrial, automotive, and various other sectors. 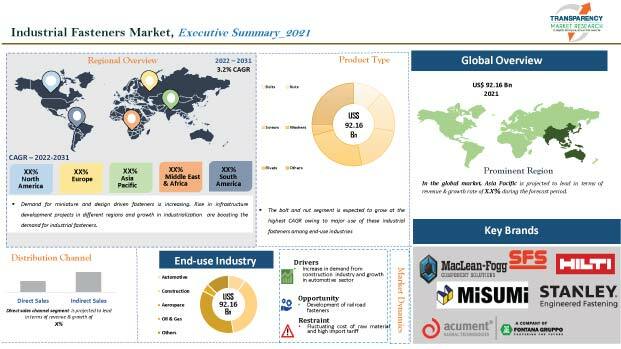 The top companies considered while studying this report for the global industrial fasteners market are Acument Global Technologies Inc., Arconic Inc., Bulten AB, STANLEY Engineered Fastening, Fortana Group, Hilti Corporation, LISI Group, MacLean-Fogg Company, MISUMI Group Inc., Nifco Inc., Precision Castparts Corp., The SFS Group, A&G Fasteners, SA Fasteners, etc.